This AidCamp was held in conjunction with our partner organisation Strategic Humanitarian Services (SHUMAS) in the rural village of Mbokui in the Northwest province of Cameroon. 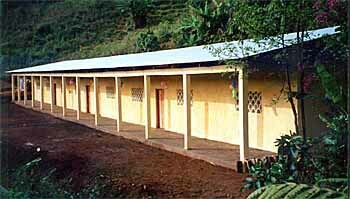 This AidCamp financed and built a primary school in the village. Previously they had no school building at all, the 280 children being taught in the homes of local families, used as classrooms during the day and family homes at night. "The minibus journey to the village was a long, slow, uncomfortable one, but the breathtaking scenery helped pass the time, as did getting to know the other volunteers. The roads were barely fit for cattle, let alone driving a minibus laden with people, but the drivers seemed to know every pothole and navigated them expertly. 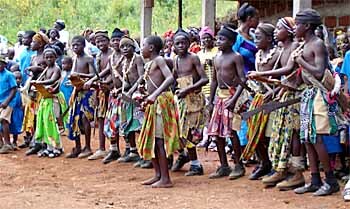 Several stops along the way gave us a glimpse of the Cameroonian way of life and as we neared our destination I wondered just what I had let myself in for. Nothing could have ever prepared me for what I was about to experience. As we pulled along the bumpy road into the village, I heard distant drums and singing. Several excited children were running alongside the bus, waving and shouting, their beaming smiles infectious to us all. Our bus journey aches and pains melted away into oblivion as floods of emotions ran over us, anticipation, surprise, excitement and this overwhelming sense of happiness. As we stepped out of the bus I felt it all too much to take in - I now know what the spice girls feel like stepping out of their tour bus for a concert. Every single village member was singing and dancing, I must have shook over two hundred hands and had more hugs than you can imagine. What had we done to deserve a welcome like this? 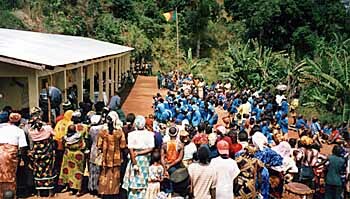 It wasn't until that very moment that it hit me, just how life changing our small financial sacrifice was to the villagers of Mbokui, Cameroon. I felt a lump in my throat and fought back tears, the word overwhelmed just isn't enough to describe all of the feelings and emotions I had stepping out of that bus! The rest of the three weeks consisted of project work in the mornings, and afternoons spent playing football (boy are they good!!) and other games with the children, we also took this time to visit other places of interest and SHUMAS projects. Before I could catch my breath we were into the last week, the school all but finished, the last few days just making it look more like a school and not a building site. 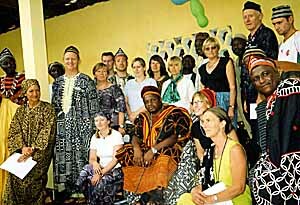 The handing over ceremony again was a sight to behold, lots of traditional ceremonies, singing and dancing. The school choir amazing us with their repertoire, all this with the traditional tribal leaders in attendance dressed up in full ceremonial regalia. In summary I want to thank AidCamps International, SHUMAS, the other volunteers, the villagers of Mbokui, Cameroon and of course the children. You have given me an amazing experience, which has changed my life forever. Thank you." "Life changing is an understatement!" "Every reasonably well off westerner should spend 2-3 weeks on a camp like this to learn to appreciate others plight and to come back to a more balanced existence." "Being welcomed and accepted by the community was a wonderful experience, and seeing the school develop over the three weeks with everyone involved was unforgettable." "For a realistic and honest experience of Africa I would recommend AidCamps." "I will never forget the welcome I received and the people I shared it with. An amazing experience." "Truly awe inspiring. The welcome that we received said it all about the people; warm, caring, and a truly honest welcome which remained throughout the duration of my stay"
"Don't hesitate -- just do it -- you will never regret it." "It certainly highlights the decadence of the modern world we live in." "Never have I been so deeply touched by a community. I've had a truly amazing experience, and have spent the past 3 weeks overwhelmed by everything." "A wonderful experience, most rewarding and something to be repeated." "It was an unforgetable experience that now I'm home seems somewhat surreal. Just thinking about those three weeks brings a smile to my face." "Across continents a farmer and I made a human connection in the simple shared action of mixing cement." "Life changing is an understatement!" "Every reasonably well off westerner should spend 2-3 weeks on a camp like this to learn to appreciate others plight and to come back to a more balanced existence." "Being welcomed and accepted by the community was a wonderful experience, and seeing the school develop over the three weeks with everyone involved was unforgettable." "For a realistic and honest experience of Africa I would recommend AidCamps." "I will never forget the welcome I received and the people I shared it with. An amazing experience." "Truly awe inspiring. The welcome that we received said it all about the people; warm, caring, and a truly honest welcome which remained throughout the duration of my stay" "Don't hesitate -- just do it -- you will never regret it." "It certainly highlights the decadence of the modern world we live in." "Never have I been so deeply touched by a community. I've had a truly amazing experience, and have spent the past 3 weeks overwhelmed by everything." "A wonderful experience, most rewarding and something to be repeated." "It was an unforgetable experience that now I'm home seems somewhat surreal. Just thinking about those three weeks brings a smile to my face." 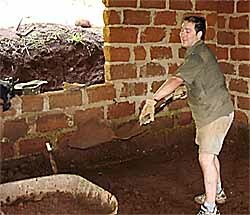 "Across continents a farmer and I made a human connection in the simple shared action of mixing cement."